Title taken from photograph caption. 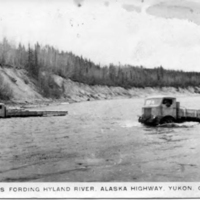 Two trucks ford the Hyland River in Yukon, Canada. A bluff can be seen on the far side of the river. 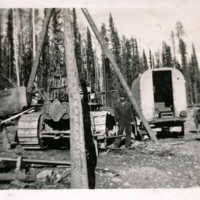 Taken during the construction of the Alaska Highway. 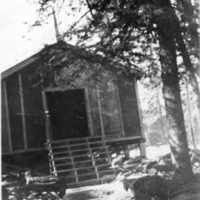 Title taken from photograph caption. 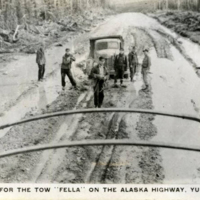 Several men stand around a truck that is stuck in mud. Standing water can be seen near the truck. 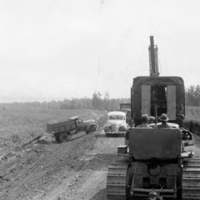 Taken during the construction of the Alaska Highway. 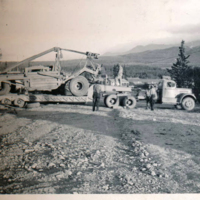 Loading out equipment from 108 W to 15 E.
Putting in a bridge at lower Liard River, Y.T. Title taken from caption. Looking across the Liard River in Canada. 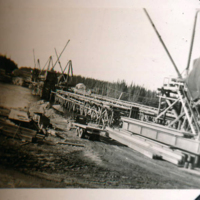 View of a partially constructed bridge during the building of the Alaska Highway. Large beams and a staircase are visible to the right of the image. Title taken from caption. 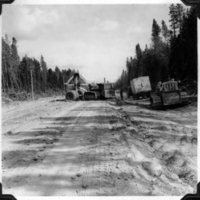 View looking down the ALCAN Highway during its construction. Two bulldozers and a truck are visible. One of the bulldozers appears to be pulling another piece of equipment and the truck has a trailer attached. Title taken from caption. 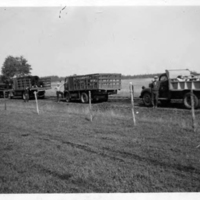 Two trucks and one heavy equipment vehicle. 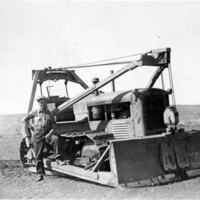 A man is standing beside the heavy equipment machine underneath the tripods in the center of the image.